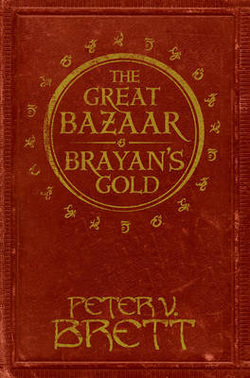 Synopsis : Two exciting short stories set in the engrossing world of The Demon Cycle from bestselling fantasy author Peter V. Brett, available together in the UK exclusively on e-book. Humanity has been brought to the brink of extinction. Each night, the world is overrun by demons - bloodthirsty creatures of nightmare that have been hunting and killing humanity for over 300 years. A scant few hamlets and half-starved city-states are all that remain of a once proud civilization, and it is only by hiding behind wards, ancient symbols with the power to repel the demons, that they survive. A handful of Messengers brave the night to keep the lines of communication open between the increasingly isolated populace. But there was a time when the demons were not so bold. A time when wards did more than hold the demons at bay. They allowed man to fight back, and to win. Messenger Arlen Bales will search anywhere, dare anything, to return this magic to the world. Abban, a merchant in the Great Bazaar of Krasia, purports to sell everything a man's heart could desire, including, perhaps, the key to Arlen's quest. 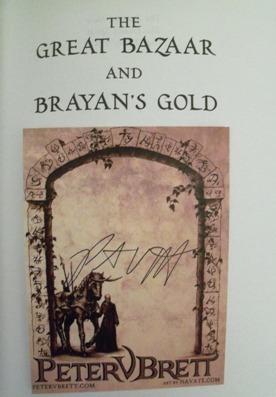 The Great Bazaar and Brayan's Gold is the essential addition to one of the most exciting epic fantasy series currently being published.